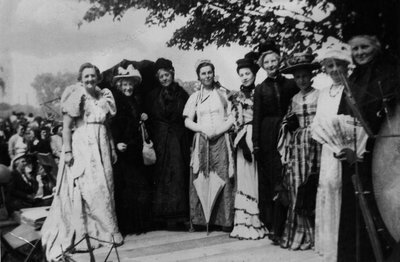 A photograph of women from Richmond Hill Women's Institute commemorating 100th anniversary of Richmond Hill Agricultural Society. Left to right: Mrs. W. Sayers, Mrs. O.L. Wright, Mrs. J.P. Wilson, Mrs. H.H. Mackay, Mrs. Rabinovitch, Mrs. Blanchard, Mrs. Pipher, Mrs. N. Glass, Miss Annie Stong.